Our CI expresses the identity and symbolism of HYUNDAI WIA. The company name “Hyundai Wia” signifies its strong will and dream to be the world leading innovator. Based on the best technology and quality competitiveness in Korea, the company not only surpasses Korea’s manufacture industries’ position but also has a dream of becoming a top-class manufacturer in the world. It is an expression of our employee’s commitment to lead the change of the manufacturing industry with our innovative technologies in all business fields such as machine tools, auto parts, and defense business. We have a strong aspiration to realize customer satisfaction one step ahead in all parts of the company, including research and development, production, quality, purchasing, and sales. Symbol mark is the most critical component in the CI design system of HYUNDAI WIA that express its strong will that it will be the engine force in the global world. Auspicious blue color of HYUNDAI WIA is the promise that it will be socially responsible and take consumer satisfaction as an ultimate aim and the red Motif in the upper middle expresses the energy of HYUNDAI WIA that will lead the company with creativity and passion for the future-oriented growth. Korean Mission of Hyundai Wia and corporate name and its logo type use the group’s unique logo and are adjusted too which should not be altered, changed and used randomly. When producing Hyundai Wia in Korean, the word ‘Dai’ of ‘Hyundai’ should be the standard in alignment and assuming the height of the word ‘Dai’ as X, the space between ‘Hyun’ and ‘Dai’ should be o.2X. Since its hard to set standard outline due to the hangul’s characteristic, set the alignment in accordance with the font size and line length. Symbol Mark is the highest brand property of Hyundai Motor group that well express its organizational feature and representativeness. When applying, standard and regulations should be well kept and image damage from any distortion, alteration and misuse should be prevented. 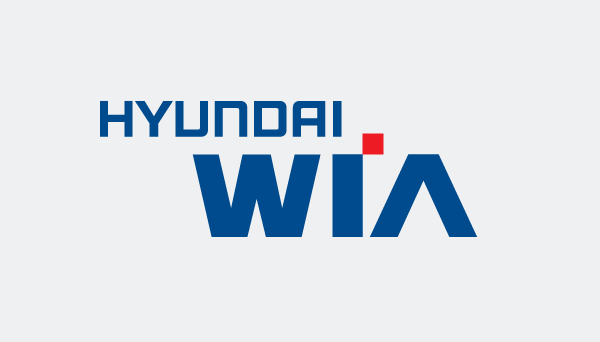 When symbol mark’s width of HYUNDAI WIA is set equivalent, then the width of the group name should be downsized by 60~85% in accordance with subsidiary company. Group symbol mark and HYUNDAI WIA symbol mark should be overlapped using at least 60% of space and combined at the upper-left side. Their distance should be maintained at the rate of 0.5H assuming group symbol mark height as H.
When expressing symbol mark as gold and silver, HYUNDAI WIA GOLD and HYUNDAI SLVER should be used. Tooling, gild, and silver leaf are possible using special print. Exclusive color is the result of systematic process using media and application regulation that sets optimum color application, expression and maintenance. Exclusive color includes HYUNDAI BLUE, HYUNDAI RED, the main color and HYUNDAI LIGHT GRAY, GRAY, DARK GRAY, GOLD, SILVER, the subsidiary colors. HYUNDAI WIA logo mark color is used in many mediums namely print, promotion paper, sign paper playing important role in delivering the company image, and therefore accurate color, brightness and chroma should be used maintained Pantone Color utilization is the principal but under circumstances, process color could be used but 4 color percentages based on the print color regulation should be kept. For sign only color standard should be applied on sign related work and to express accurate color in the process, color sample in the manual should be referred. HYUNDAI WIA color system has communication flexibility and therefore subsidiary color utilization should be confined to supporting the main color only.